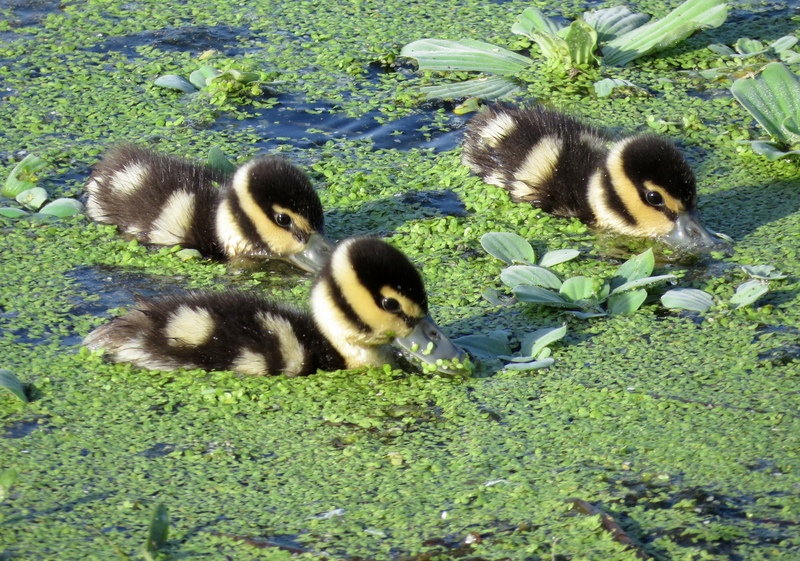 The Bumble-Bee Ducklings are back! 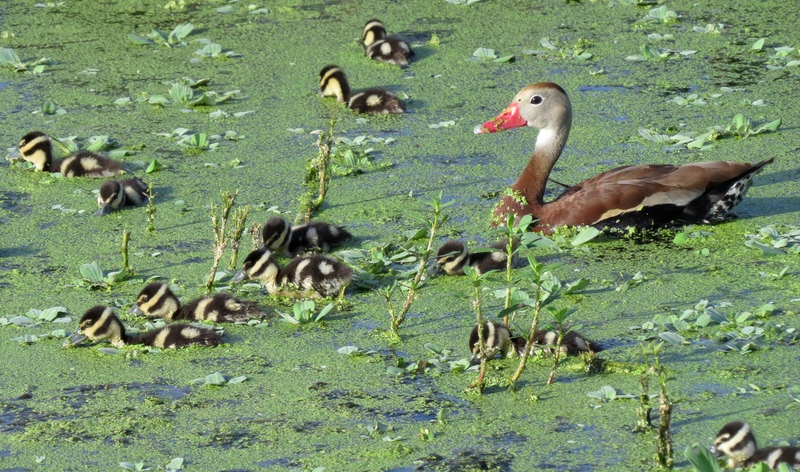 This is the moment we’ve all been waiting for – the arrival of a large new group of Black-Bellied Whistling Duck babies! 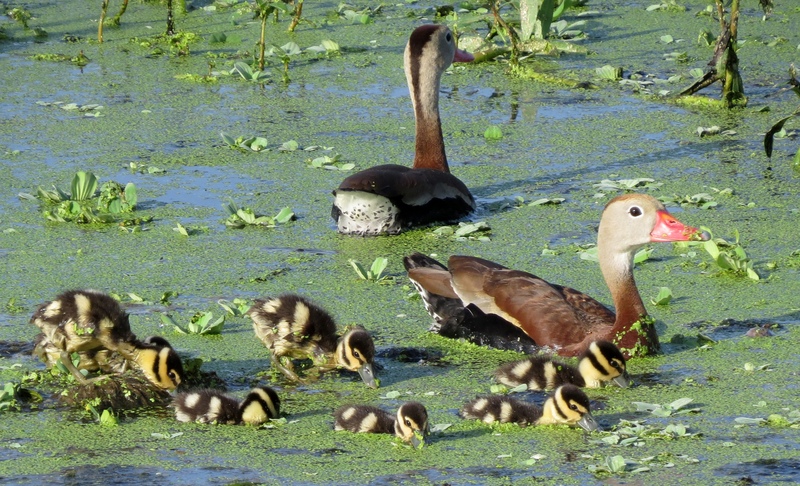 The Black-bellied Whistling Ducks are everyone’s favorite, I think – the adults always look so handsome, with their long necks, beautiful coloring, and upright posture. And the babies are just an absolute treat – with their distinctive black and yellow stripes, they make the pond look like its abuzz with a swarm of fluffy Bumble-bees. In fact, this short video clip gives you an even better idea of their level of activity! They are in constant motion, feeding on this delectable, grand swath of duckweed. 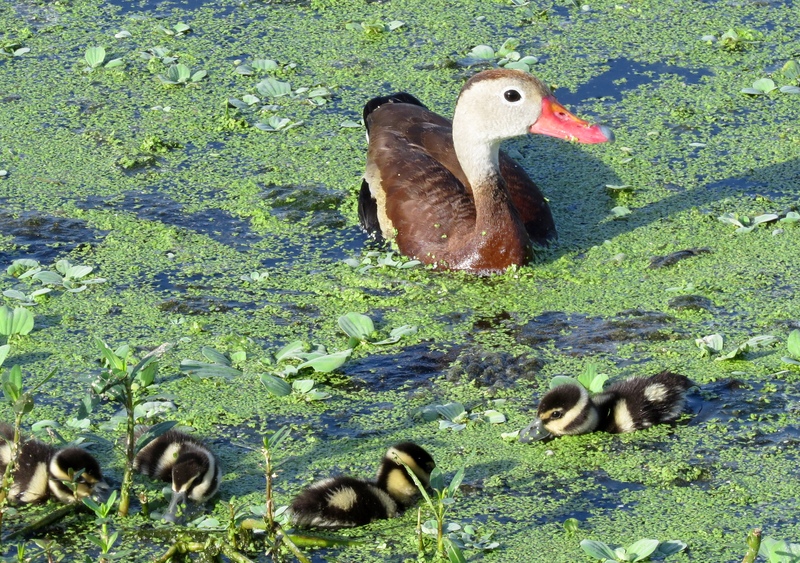 The Black-bellied Whistling Ducks have been breeding here every year, and we always wait with great anticipation for the little ones to arrive. It’s especially exciting at first to see so many of them at once! Notice the ever-watchful eyes of these parents as they oversee their brood of about 16 ducklings. The babies are doing a good job of feeding themselves, and they eat non-stop – their heads barely come up above the surface – while the protective adults serve as guardians, looking out in all directions. They are so charming and fun to watch that I’m including more photos in this post than usual – just can’t resist! Click here to see previous posts with several links to further information and resources about these wonderful ducks. 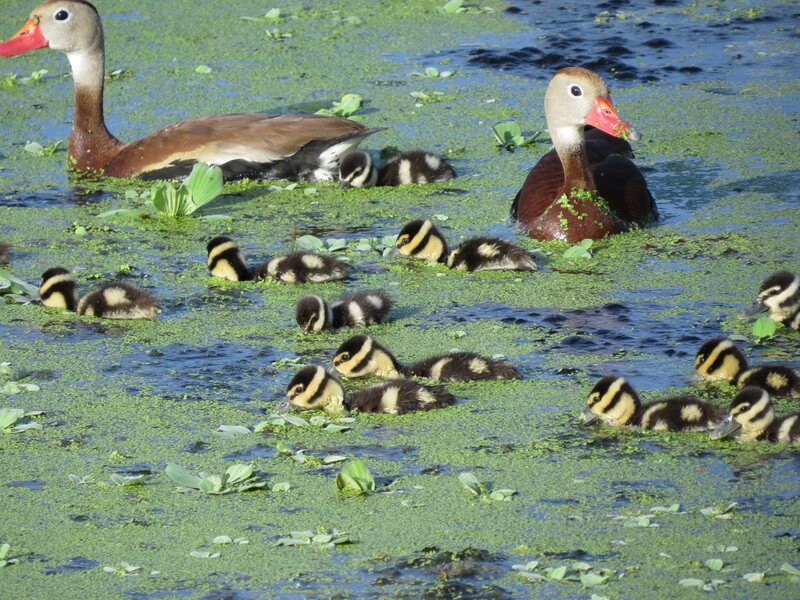 This entry was posted in Birds, Marsh/Wetlands and tagged Black-bellied Whistling Duck. Bookmark the permalink. Yes, AB, it’s so beautiful to watch how protective the parents are while trying to herd such a large family of little ones in the open water. Cool-looking ducks. I loved the video–they really do like swarming bumble bees. We have a variety of ducks here whose ducklings are certainly adorable, but these take the cake! Great captures, Thank you for the post, Bj! I’m so pleased that you enjoyed them, Amy. It really is a thrill when there are so many of them, and they actually swim toward you and get so close! Thanks for all the pictures, Birder. They are adorable. I have never seen anything like this. I never saw anything like this before either, till I moved to Florida when a half years ago. What a place for birding! Those ducklings are adorable! Never seen one like that before…although in Florida too. Thanks, Tiny! The sources I checked don’t seem to agree on whether or not their range includes Florida. I think they breed in only certain areas of the state. They are so cute. They do look like bees. So far all 16 ducklings are still doing well~! We awoke with a family of 13 on our pool. They are truly adorable. Wow what a surprise. I too hope they thrive – Who knows, maybe it would be safer in such a community than in the wild?! Very nice! Plus really cute ducklings! Hope to photograph them one day! We saw some again last week, but I didn’t have my camera. They are so adorable! Thanks, Pam. 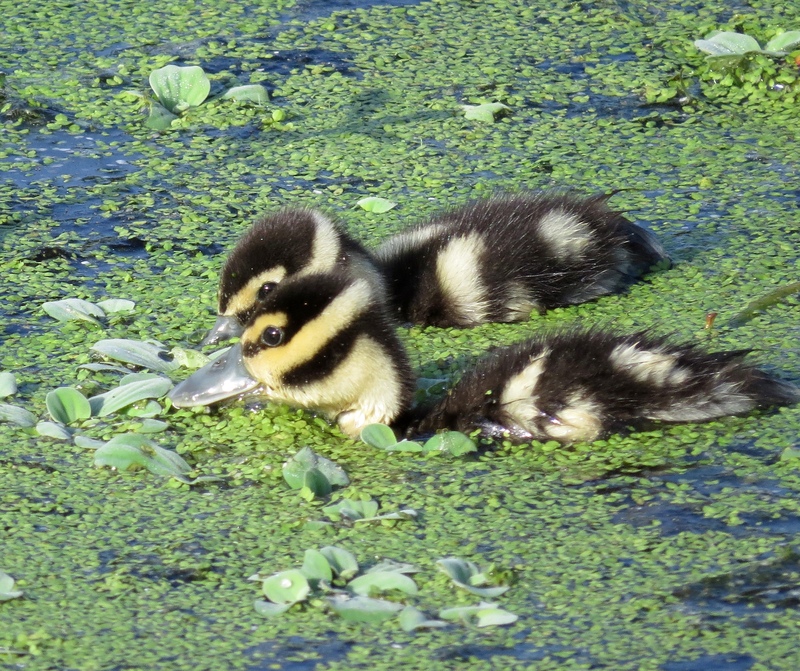 This was an older post, but we spotted new adorable BBWD ducklings again recently – if I’m lucky, I may photograph them before they get too big.